HVLP Technology is a growng segment in the spray equipment industry. Not only is it a superior method of spraying because of increased the efficiency it provides, but it also offers the painter more control of the spraying operation. In addition to that, HVLP is a much more environmentally friendly method of spraying because of the reduction of emissions. You will quickly realize that HVLP is a great choice when selecting spray equipment. 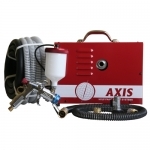 The Axis HVLP Paint Sprayer is available in three and four stage turbine power. We do not manufacture our own paint spray guns. This is to your advantage! Neither you or we like phone calls with spray gun problems. Therefore, we purchase the best guns we've found. 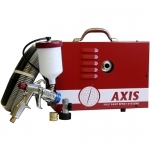 We all can enjoy that our spray guns are tested and spray well right out of the box. Choose a four stage paint sprayer when you need the finest atomization. More power makes finer droplets and a finer finish. Fresh air is recommended when spraying any polyurethane or two part materials which produce isocyanates.